Test Preparation Workshop | Save My Reading Life! When it comes to success, there is no magic potion, secret password, or innate talent that makes it possible. General Powell is very right: it is preparation, hard work, and learning from your failure that makes success possible and his advice also applies to exams. 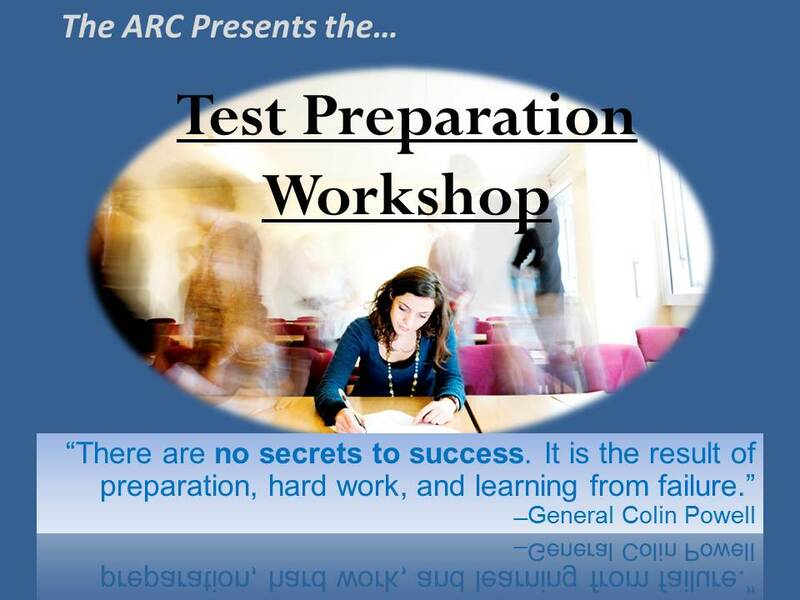 In this workshop, I will discuss these three things: preparation, hard work, and learning from failure and how they apply to being ready for your exams. Slide 2: Prepare, prepare, prepare! 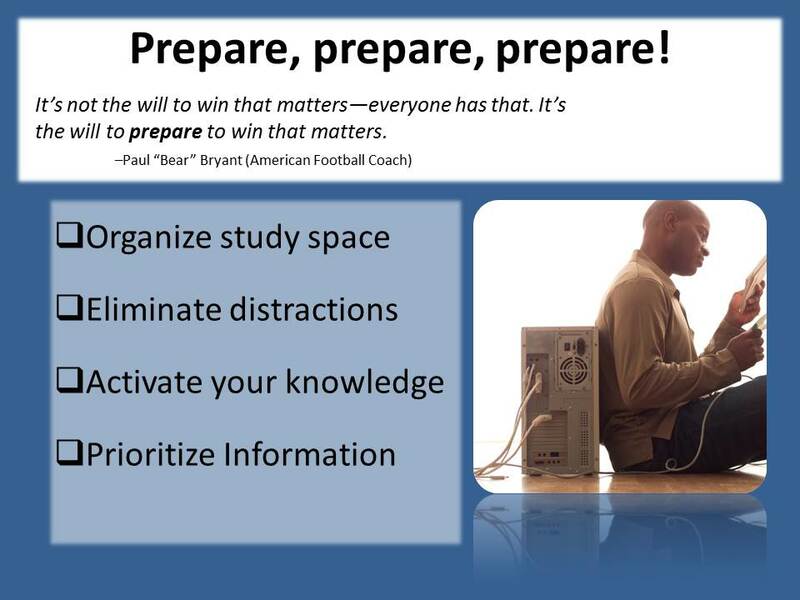 The first step to doing well on exams is preparing; you must prepare! Before you begin to study, you must prepare your study space, you must prepare your mind, and you must prepare the information by having a plan of action. Organize your study space. First, find a place that will allow you to be productive. Sometimes, this space is not the most “comfortable” place in the sense that you may not be able to lounge, or relax; that is ok. You want a place to work, not a place to sleep, so bedrooms, living rooms, and porch areas are generally not good spaces to study. Kitchens, like at a kitchen table, office, or even a cafe can work. Remember to find a place that has noise at comfortable limits. Some people cannot study with even the slightest noise; others need music or white noise to help them stay focused. If you’re a person who needs complete silence, make a point to find a place quiet enough to suit your needs: going to a cafe to study will not help you to stay focused. If you’re a person who needs noise, then make sure you have a way to listen to your music. Try to listen to your music on a device that will not distract you with social media notifications (like an iPod or MP3 player), or be sure to turn off your notifications, to keep distractions to a minimum. Once you find a place, organize your materials. Make sure you have everything you need to be productive: pens, pencils, sticky-notes, highlighters, your note books, textbooks, index cards, etc. Also make sure you have items that will help you stay in one place: bottles of water, a few snacks, a stress ball, or any other items to help you stay focused. While not all of these items are mandatory, the more you have at your finger-tips the less likely you are to leave and interrupt your thought processes. Gather all your class materials for the class(es) you wish to study. This includes your textbooks, note books, handouts, study guides, CD-Roms, PowerPoint notes, etc. Eliminate distractions. Before you begin your official study session, take a moment to keep your digital life from distracting you. Turn off your Facebook notifications and silence your phone. If your computer is not necessary to study, then you may consider turning it off altogether but, if you do need to use your computer, you want to make sure you do not let your social media browsing distract you. If you find you cannot control how often you visit these sites, you can use a site like KeepMeOut to help you control when you can visit these sites. There are also browser apps, like the StayFocusd app for Chrome, to help you block troublesome sites. Prioritize information. Once you have an organized study space, free of distractions, then you must prepare your mind and the information you plan to study. Students will often ask themselves: Where do I begin? This is an excellent question because there really is a better and worse place to start when you begin to study. 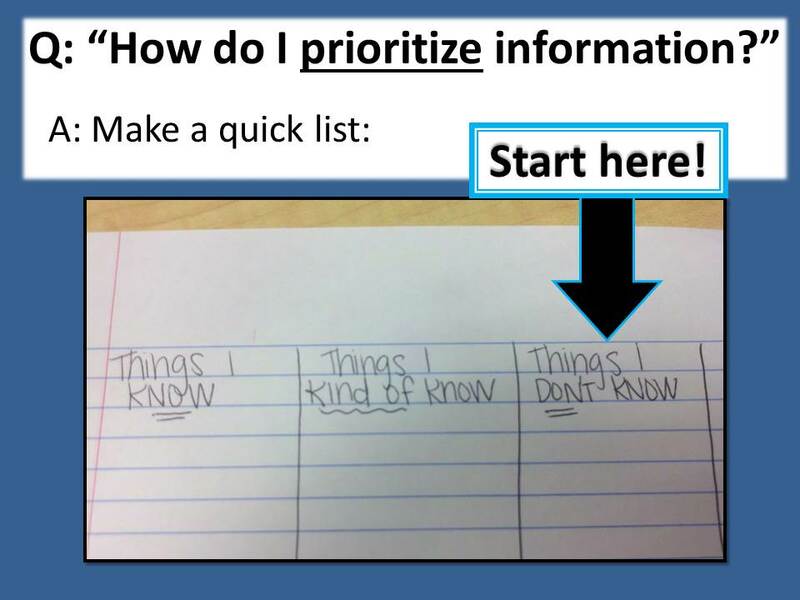 “How do I prioritize information?” you’re probably asking. It’s not nearly as hard as you’re probably imagining. Prioritizing information means that you make a point to be conscious of how much time you have to study, and how much information you need to cover. Many students begin with the easiest material believing that it will make them “feel good” about the exam since they know everything. Or, they start with the material they are most familiar with because they worry they will forget. Neither of these approaches are ideal. One thing to remember about studying is that you want to be a little uncomfortable. When studying, you do not want to feel like you “know it all,” or that you are “really confident.” Your goal while studying is to find the hardest, least-memorable, most confusing material and make sure you spend the most time with this material. To do this means that you do not begin with the “easy” material first. You want to begin with the hardest, least-memorable material. To locate the hardest, forgotten material, make yourself a quick list. Take a sheet of paper (even junk paper) and draw lines to create three columns. Label one column “Things I Know,” the next column “Things I Kind-of Know,” and the final column “Things I Don’t know.” Then, go through your study guide or, if not study guide is given, create your own, and list each item on the study guide into one of the columns on your page. The material you want to begin with is in the “Things I Don’t Know” column. Imagine that you only have one week to study for your exam and, in that week, you have a total of ten hours to commit to studying. After completing the listing activity above with your study guide that has a total of fifty items, you find that you have a total of twenty-five items in the “Things I Know” column; twenty items in the “Things I Kind-of Know” column; and fifteen in the “Things I Don’t Know” column. Assume that your teacher will only select half (twenty-five) items from the study guide to test you: while the likely hood of the teacher selecting all fifteen items in the “Things I Don’t Know” column is quite low, those fifteen are the ones that will hurt the most if you do now know them. If all twenty-five come from the first two columns, then you’ll get at least a C on the exam–passing by most standards. The fifteen in that final column are the most problematic. The other thing to remember is that those fifteen (in the “Things I Don’t Know” column) are most likely the hardest, too. You do not understand them for a reason: perhaps you missed reading that chapter of your textbook, or missed the class in which your teacher covered that material; or perhaps the material is so challenging that you may need to find a peer or tutor to help work with you, or reach out to your instructor for extra help. Basically, you might need all ten hours to devote to those fifteen items and, if you did start on the easier stuff–the stuff you already know–you may not realize you need that extra time until it’s too late. Once you know where to begin, then you can start creating materials to study from. Here are three ways to learn, and retain, those problematic materials. Summarize & Paraphrase. One way to make sure you understand something is to summarize and/or paraphrase. Summarize is condensing down information to its most basic and important elements; paraphrasing is putting the information into your own words. When studying, first take the information you need and filter out anything that is unnecessary–that is summarizing. Then, take that information and rephrase it in a way that makes sense to you; that’s paraphrasing.While summarizing is an important step, you do not want to simply try to memorize your summaries. Remember that memorizing is not understanding! Trying to commit your summaries–or just chunks of the textbook word-for-word–to memory will do very little to help you understand the materials. Paraphrasing forces you to think critically about, relate to, and see the big picture of the information you must learn. Another way to think about paraphrasing is this: think about how you would explain the material to a seven-year old child. Think of the questions the child would ask you and how you would answer. If you can explain it to a seven-year old in simple, clear language, then you know that you understand it! Create Maps & Outlines. Maps and Outlines are another way to make sure you remember the material. 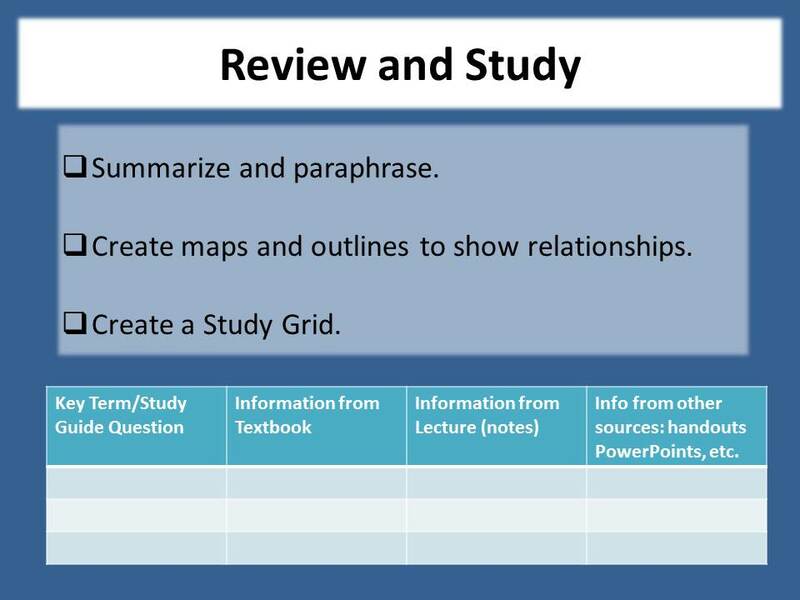 Once you have summarized and paraphrased the material you can create an outline or map to see how it fits into the larger picture of your class. It’s important to remember that your map/outline is for your use only, which means you do not need to focus on perfect handwriting, correct spelling, or complete sentences (though spelling might be important, especially if you have to do a written final). Take a sheet of paper (in your notebook, preferably) or use an spreadsheet program on your computer (like MS Excel or Google Sheets). Draw as many lines as you need to give yourself a column for each resource in your class: textbook, lecture notes, PowerPoint presentations, outside research, YouTube videos, etc. In each row going down your page, list your study-guide term, question, or vocabulary word. Look up each term, word, or question in each of the resources, listing the information given in each box. When finished, you’ll have all your information in just a few pages, making it easy to review and study without having to carry, reread, re-find your materials. One myth about studying that I work very hard to dispel is that reviewing and rereading are the same things: they are most definitely not. Rereading can be a useful strategy if you did not understand material the first time (or second time) you read it. Rereading is what you do when you read material, still do not get it, and must read it again. If it took you five hours to read it the first time, it will take another five (or even more) to read it a second time. Rereading is not a good strategy for studying. Reviewing, on the other hand, is an excellent strategy for studying. Reviewing does not have to be a long, lengthy process; if it took five hours to read a chapter, it may only take you fifteen minutes to review it, depending on how new or challenging the material is. To review, simply look over the already-read and already-understood material briefly. You do not need to reread all of it; in fact, it is often better if you, instead, look over the notes, summaries, paraphrases, and bullet points you may have written in the margins. Review more frequently at first and less frequently over time. 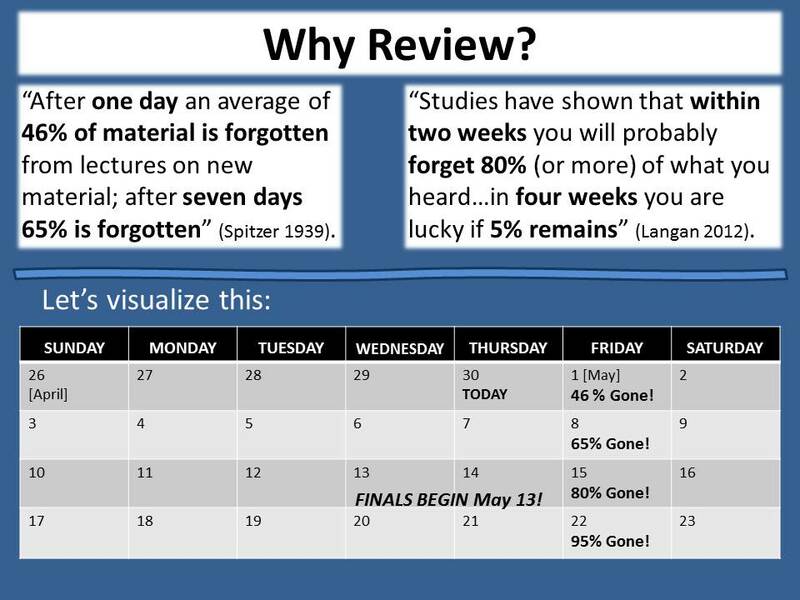 I suggest reviewing material every day for a week, then three times a week for two weeks, then twice a week for two weeks, then once a week after that until the week before finals (or until you are being tested on it). Adjust this in whatever way works best for you! One of the most frequent complaints I hear from students is that they suffer from crippling test anxiety. General test anxiety is actually quite normal. 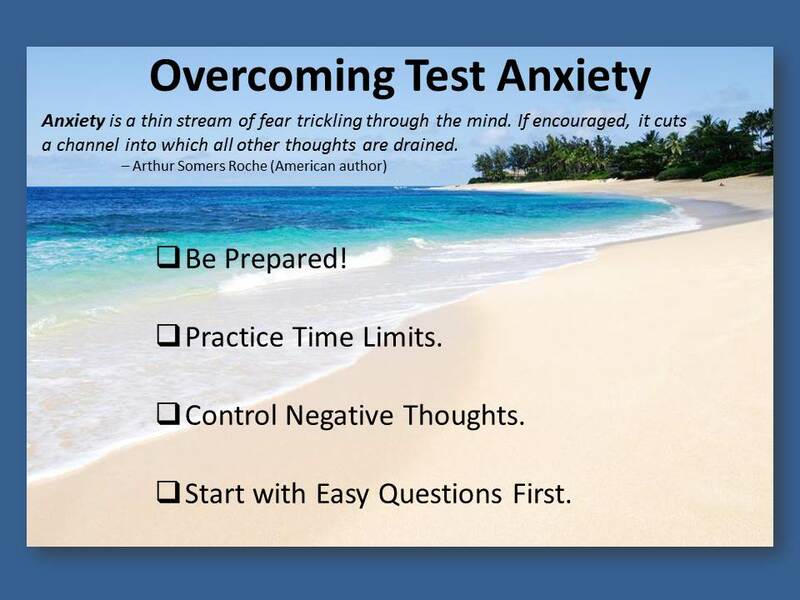 Test anxiety, and anxiety in general, can be crippling to some people however it is rare. If you try all of these measures to study and still find yourself incapable of completing a test, I will suggest you reach out to your doctor and the Disabled Student Programs & Services (DSPS) program for further assistance and testing modifications. Be Prepared. Students who wait until the last minute, then cram the material the night before are going to experience anxiety. Instead, review often over the course of the term, and prioritize the material so you’re spending the most time with the hardest material and you will find that your anxiety is much less. Practice Time Limits. If time limits, or the idea of the time limit, makes you anxious, then practice studying or simulating the exam with a time limit. For example, for many students having a timed writing exam is extremely stressful. One way to overcome this stress is to practice writing while timing yourself. It does not even have to be “structured” writing; you can simply set a timer for an hour (or however long you wish), then journal for that time just writing whatever you want so you have an idea of what it feels like to write for an hour. Doing this also builds up the muscles in your hand so you will be less likely to experience hand cramps. Control Negative Thoughts and Emotions. Negative thoughts and emotions can greatly impact your testing. It’s important that when you find yourself saying things like “I just know I’m going to fail!” that you offset them with more positive sayings like “I’m going to do my best and I will succeed!” Ultimately, you want to avoid putting yourself down or predicting your own failure. If nothing else, just think about how even the worst grade can teach you something and will be a stepping stone to improving yourself next time. Power Pose! Before the exam, take two minutes to power pose. Your body language going into the exam can lead to those negative thoughts and emotions that you want to avoid. I’ve been having students try this method and so far students who’ve tried it have found it works to help them control those negative thoughts and feel more confident during the exam. Start with the Easy Questions First. When you sit down to finally take the exam you may be hit with a wave of anxiety if you see the first few questions are tough. In that case, look over the entire exam first to get an idea of just how hard (or easy) the exam is. Once you do, you may feel better and more confident. You can also answer the easier questions first and save the harder ones for the end. Keep in mind, there is no rule that you have to start with question one and end with the final question. In most cases, you can complete the exam in any order you like. Do the exam in the order that makes it easier on you! 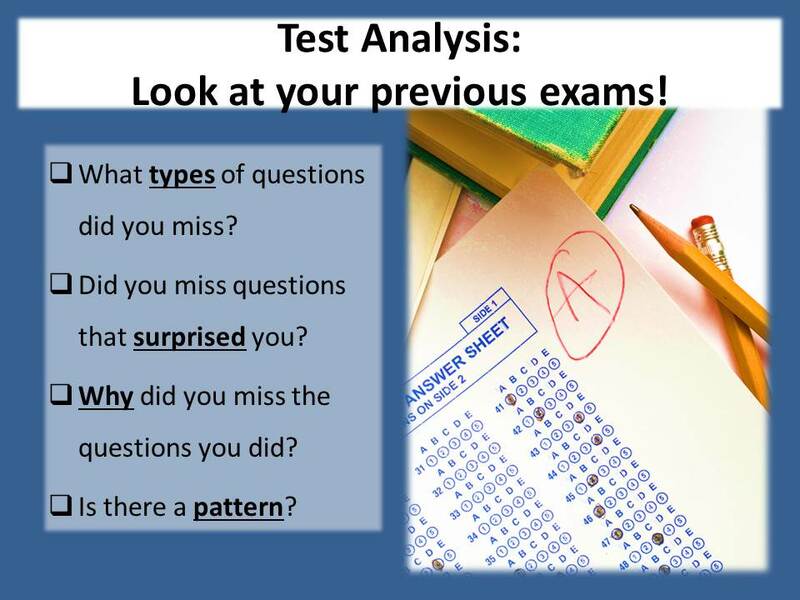 Regardless of how you did, a TEST ANALYSIS can tell you a lot about how to improve for next time. Each time you take an exam (or quiz), look over the questions you got incorrect and ask yourself “why did I make this mistake?” You can then create categories of errors that will help pinpoint you to ways to avoid those same mistakes in the future. Langan, John. (2013). Reading and Study Skills (10th ed.). New York, NY: McGraw-Hill Companies, Inc.
< Previous Reading & Writing Help this Summer!